We kicked off our Interview Series with Elena Ionenko, Business Development Director of Turnkey Lender. 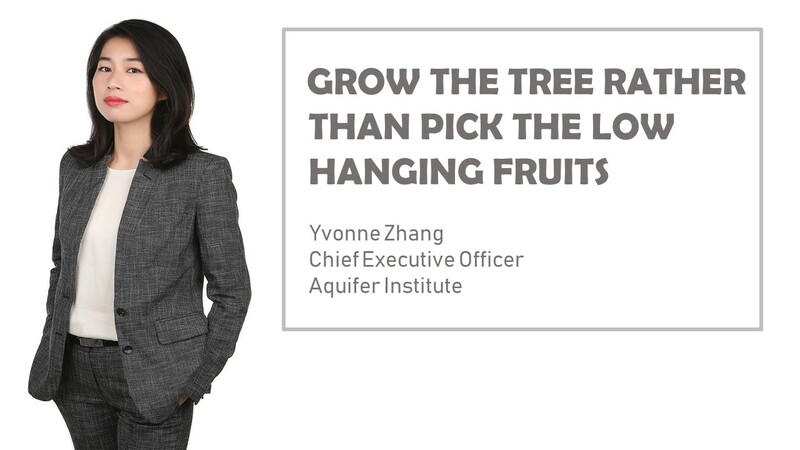 For the month of February, we’re delighted to have Yvonne Zhang, CEO of Aquifer Institute, share about her experiences in FinTech. How is being a leader and heading a business different in a corporate versus being in a startup? There’s ‘extreme ownership’ in leading a startup. Attempting to forge a new path of solving long-standing commercial problems with limited resources takes very high levels of discipline, pragmatic creativity and mutual trust within the team. One year of leading Aquifer has depleted most of my corporate leadership experience from the past 10 years, from platform architectural conceptualisation to shipping beta within 6 months. The speed at which we moved is impossible in a corporate environment. What are some of the curveballs you have experienced in running your business and how have you dealt with them? The stress and self-doubt didn’t come as a surprise. What was surprising was the amount of positive influence that came from my team members, external stakeholders and just about everyone we came across in our journey so far. Doing things for the right reasons and sticking to it in every decision we make is hard, but people do notice and respond with openness and warmth. Is there ever a good time and can you prepare yourself to be an entrepreneur one day? The adage: “Don’t take a knife into a gunfight” rings especially true in the entrepreneurial world, where preparation is everything. For me entrepreneurship didn’t just happen, I prepared myself since university days to acquire the breadth and depth of legal, commercial and quantitative sciences knowledge to handle running a public company. The experience of being the youngest member of a not-for-profit board (Redfern Legal Centre, the biggest provider of free legal aid in Sydney) is invaluable in running Aquifer now. My career in commodities trading and derivatives structuring helped broaden my network which is the lifeblood of starting a new venture. Relationships with regulators, buy/sell side, service providers and academia need to be there already before the company starts running. Do you think your industry is progressing at the right pace? How do you see your industry evolving in the next 5 years? Aquifer straddles a few industries: century old commodities trading, collateralised financing, fintech R&D and quantitative sciences. The pace of change (slowest to fastest) have been in this order for decades. In the next 5 years, we see that the rise of multi-discipline platforms like us, and the network effect generated in the ecosystem, can push these industries forward faster than they are able to individually. Open sharing of protocols, benchmark standards in terms of legal documentation to allow enforceability of smart contract solutions, better data collection, sharing and integration of rigorous quantitative risk management models are starting to happen and I’m excited to see positive changes blossom. Can you share a crystal ball prediction for 2027? When I gaze into the WiF communal crystal ball, the only things that are certain in 2027 are the lunar and solar eclipses on Feb 20 and August 2 2027 respectively. Apart from these externalities, each and every one of us have a hand in shaping how the world looks, functions and feels that year. I hope we’d enjoy a renaissance in the advancement of scientific knowledge across all disciplines, the world should move beyond only propagating the commercial application of existing technology for short term gain. Let’s grow the tree rather than pick the low hanging fruits! What is the one piece of advice you would like to give to your younger self? Or to the aspiring female entrepreneurs? Be more confrontational – confront yourself first and foremost, do not make or accept excuses; confront any issue that’s bubbling up internally and externally, problems are not interest bearing bonds, waiting does not pay. With that said, differences in opinions among the team happen daily and not everything can be resolved within the timeframe that we desire, so keep communicating but be patient, with yourself and with others alike.